The fans have been asking for it, and finally, it’s almost here. A lot of features in NBA 2K15 are returning with some slight modifications to adapt to the UAAP system. Similar to the MyPlayer feature of NBA 2K15, UAAP 2K15 will also have a MyAthlete mode that allows the player to make his own high school athlete. The player should then impress scouts in basketball camps in order to receive a five-year athletic scholarship to a UAAP school. If a player wants to get a scholarship from DLSU, for example, they would need to catch the attention of DLSU head coach Juno Sauler or sports patron Danding Cojuangco in multiple exhibition games. The MyAthlete will be given five years of eligibility by the league and individual awards such as Rookie of the Year or the MVP Award will help determine if the player will be able to turn pro after his five year college career. One big difference between the MyAthlete and the MyPlayer modes is that the former is required to go to classes and pass the quizzes in between league games. The UAAP women’s basketball teams will also be playable in the game making UAAP 2K15, the first game to officially feature female basketball squads. The featured athlete on the cover will depend on where the game is sold. 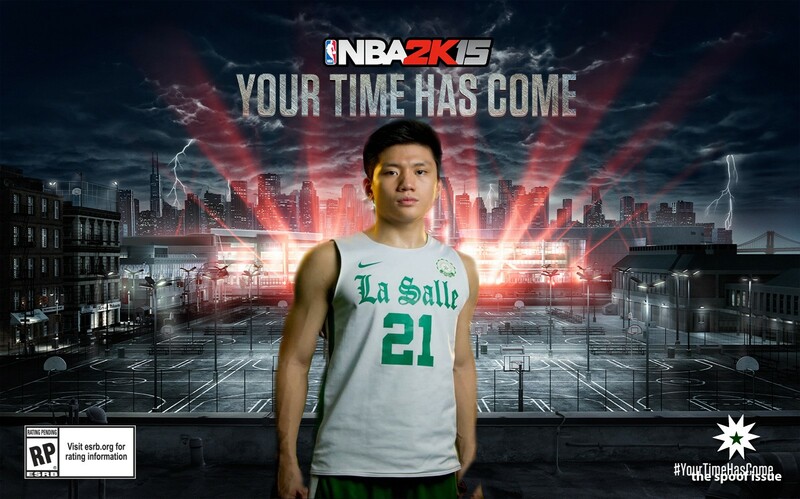 Thus, there will be a total of eight different covers for UAAP 2K15. The covers will feature key players from every school. For DLSU, no decision has been made yet as of press time. According to a survey conducted by The LaSallian, big man Yutien Andrada is leading in the cover athlete race followed by coach Sauler and Jeron Teng. Even the coaching staff is glad with the news. According to assistant coach Allan Caidic, the game will also help them in their team practices as they prepare for the next basketball season. In a press release by the UAAP, pre-orders are said to be available in every UAAP member school beginning April 30. Those who will avail of the pre-order will get bonus packs for the MyAthlete feature and 10,000 peso virtual currency that can be spent in the game.